Following H.H. Gossen and W.S. Jevons Sam de Wolff bases his theory of value on the disutility of labour. In this way he opposes the Austrian School, that denied the existence of a relation between the production costs and the value of the end products. In the Austrian view the value originates completely from the subjective preferences in the consumption. In the course of time this standpoint has become common in the economic science, albeit with some nuances. It is worth while to once more compare both standpoints, because in all his controversies De Wolff has always exhibited a sound intuitive sense. The idea, that besides pleasure (utility) also pain (disutility) determines the human preferences, has been formulated ages ago. Jeremy Bentham (who lived from 1748 until 1842, and incidentally was a rather unsociable scientist) developed a philosophy that is founded on the largest happiness principle. Pain is bad. In 1854 this idea was picked up by Hermann H. Gossen, who has expanded her into an economic theory of the marginal utility. Unfortunately the spirit of the time was not yet ripe for the proper appreciation of the work of Gossen. More than fifteen years later, in 1871, both William S. Jevons and Carl Manger rediscover independently of each other again this concept. Now it does catch on. Incidentally only Jevons introduces the concept of disutility in his argument, and not Menger. Sam de Wolff calls himself a marxist, so that he ought to reject the neoclassical value theory, that is based on the human subjectivity. Value is produced during the production, as an objective asset. Yet he has to a large extend shared in the euphoria about the marginalist analysis, which in his era had come on firm ground. His marxist position becomes apparent mainly in his persistent resistance against the Austrian School, which then had important supporters like C. Menger, E. von Böhm-Bawerk, and F. von Hayek. In his main economic work Het Economisch Getij De Wolff invokes the publications of Gossen and Jevons for his counter-attack, and he seems to cite in particular the text of Gossen (without clear references)1. De Wolff could not resist the temptation to invent new names for the analytic concepts in the theory. Where Gossen writes about pleasure in life (Lebensgenuss)2 and Jevons about utility3, there De Wolff chooses the name lust. And where Gossen and Jevons use the word inconvenience (Beschwerde respectively disutility), and others use the word Leid, there De Wolff prefers the name onlust. But for the rest De Wolff seems to apply simply the examples of Gossen. See an earlier column about this theme, as well as its elaboration. In imitation of Gossen he even models the marginal lust and onlust (called intensities by De Wolff) by means of linear functions4. Both Gossen, Jevons, and later also Alfred Marshall start from the hypothesis, that under favourable conditions the work can be a pleasant and spiritually enriching activity. Labour becomes an onlust only, when the working-day is too long, or too intense, or when the conditions are otherwise inhumane. 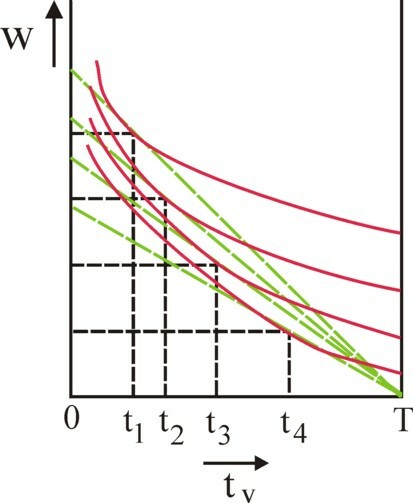 The figure 1 shows the utility of labour (casu quo disutility) N = −L and the marginal disutility ∂L/∂t as a function of time, like Gossen imagined5. 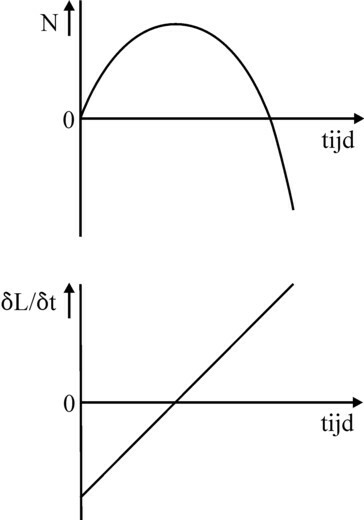 In the picture below the marginal utility changes into a disutility, as soon as the horizontal axis is crossed. From that point onwards the labour obtains a special meaning, because the phenomenon of the disutility has the consequence, that the people put a clear limit on the number of hours, that the are prepared to work. In the columns just mentioned a Robinsonade (originating from Gossen) is used to show, that the worker determines his working hours on the basis of the amount of goods, which he can produce during that time. Those goods yield a certain pleasure, and by doing so compensate for the onlust of the labour. The consequence of this model is, that the value of the goods is related to the expended number of working hourse. The production costs determine (partly) the value of a product unit. This is worth a moment of reflection: a worker does not stop working, because he prefers to do a more pleasant activity. His motive is not the temptation of leisure time. No, it is the subjective aversion against additional working hours, which incites him to stop. The German sociologist Frank Deppe states:6 "In general workers experience their labour as a heavy load, which is insignificant in content, and which is seen and perceived as a means for survival (one does not live to work, but one works to live!). The work itself is without any interest, and causes merely resignation". Apparently the quality is miserable. Incidentally also the reader may recognize this feeling, and sociological studies are not needed to obtain this insight. Thus the onlust intensity of labour seems to be an excellent concept for studying the wage and the supply of labour. Your columnist has searched the world wide web, but without results. In particular one wonders about the role of the labour productivity (ap) in this argument. 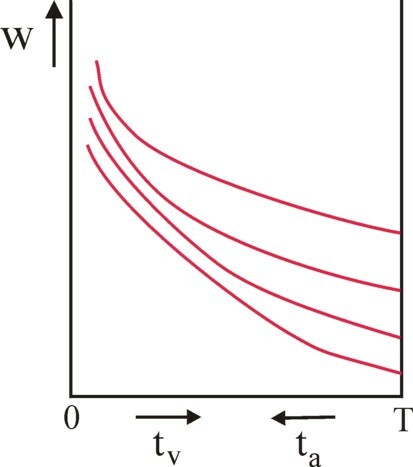 The behaviour in the figure 1 is derived for a constant ap. However, if the worker is not free to stop working, then he will undoubtedly resort to decreasing his ap. The future onlust can be controlled. But admittedly your columnist does not know an economic theory, which models this phenomenon. The representatives of the Austrian School have vehemently attacked the idea of the disutility. According to Spencer especially Von Böhm-Bawerk and Von Hayek wanted to discredit the labour theory of value of Karl Marx, and therefore they refused to attach meaning to the production costs7. In the Austrian paradigm all product value is caused by the subjective needs and preferences of the consumers. In their view the quality of labour is unimportant. This eliminates the debate about the exploitation and alienation of labour, which is leading in the political economy of Marx. In the Austrian perspective the consumption determines all values, and that pertains even to labour. For the worker chooses the number of working-hours according to his need for leisure time. On the one hand his total wage rises, when he works longer. Then he can buy more consumer products, and these yield an additional utility. The opportunity costs, that he must pay for the extra work, consist of the renouncement of the leisure time. In this way he again gives up some utility. The worker himself chooses the length of his working-day, in accordance with his consumptive preferences. The new paradigm, which later was named the neoclassical theory, is a rupture with the past, when the classical theory still dominated. In the classical theory the product value is derived from the production costs, including the expenses for wages. In the new paradigm the wage costs are completely absent, with regard to the price formation of the commodities. All prices are formed in the exchange process on the basis of subjective needs, and they are related to the scarcity of the products. Then the wage costs are merely relevant for the supply on the labour market. The labour is simply a means for the worker in order to obtain an income, which satisfies his need for consumer goods. The disutility of labour as a determining factor is eliminated. Time is a scarce commodity. That pertains both to the labour time and the leisure time. Leisure time is presented as a good, which is instrinsically pleasant8. Now the reader will understand, that according to your columnist the Austrian paradigm is an impoverishment with respect to the paradigm of Gossen, Jevons, and De Wolff. The element of labour is missing, the disutility (inconvenience), which in practice is so obvious. Of course the Austrian position can be attacked with intellectual arguments. For instance Alfred Marshall stated, that many unemployed workers endure their leisure time as if it is an inconvenience instead of a pleasure (utility). That is true, just like labour can sometimes be a pleasure. The fundamental criticism is evidently, that the Austrian paradigm makes an unrealistic assumption in order to determine the size of the supply on the labour market. the concept of time and the opportunity costs of leisure time can be simply included in the formalism. The following paragraph will elaborate on this point. It is no longer necessary to discuss the quality and the intrinsic value of labour. Spencer concludes that the neoclassical paradigm has left a theoretical void, which is filled by the American institutionalism10. Your columnist does not warm to the Austrian and neoclassical model of the labour market. However, it is useful to describe it, because this is seldom done properly in the introductory text books. The present description originates from the excellent text book Volkswirtschaftslehre by M. Heine and H. Herr11. It is remarkable, that the disutility (in the interpretation of this model) is equated simply to the relinquished pleasure of leisure time. The model is founded on a number of assumptions. There is one type of labour, so that the diversity of professional qualifications is ignored. And the working-time can be divided at will, so that a labour contract can enforce any number of working-hours. The market is perfect. In other words, monopolies such as the organizations of employers and workers, are ignored. Another crucial assumption is that the system is a so-called one-good economy. The capital and the wage exist of a quantity of a single product, which is commonly chosen to be corn. he must decide about the optimal expenditure of his income w, that is to say, its distribution over the various consumer goods12. In the model the collection of consumer goods is limited to corn. In the formula 3 ωu represents the hourly wage, the wage level, expressed in a quantity of corn. Of course the term T − tv is simply ta. It is immediately apparent that the maximal possible wage wmax equals w(tv=0). The slope of the budget line is given by the wage level ωu. In the figure 3 the budget line is drawn for four values of the wage level. Finally the figure 3 allows to construct the supply curve A = A(ωu, N, T) of labour for the separate households. Then the optima of the households must be simply drawn in the cross of axes (ta, ωu). This is done in the figure 4. The social supply curve for labour from all households is obtained by adding for each value ωu the working-hours ta of all the separate households (workers). Then a curve is naturally found with a shape that is similar to the figure 4. 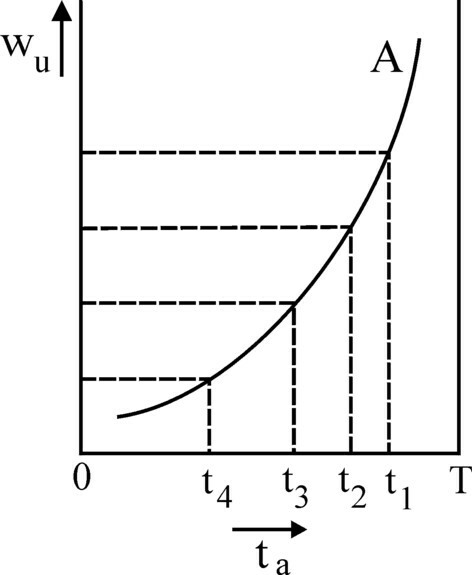 In the neoclassical theory the demand curve is combined with the supply curve in order to determine the equilibrium on the labour market. However, in practice the stock of capital goods is given. Therefore the demand for labour can not rise indefinitely, contrary to the supposition of the neoclassical theory. Moreover the neoclassical theory assumes that the scale of the production does not influence the productivity. However, in reality it is common that the marginal productivity of labour rises when the scale is increased. A larger scale implies a higher wage level. In any case this phenomenon clearly shows, that the theory is sensitive to the development of the production technique. Evidently the assumption of a single-good economy implies that the model is far from reality. Unfortunately the assumption is indispensable, because else the wage level would influence in an unpredictable manner the prices of the consumer goods. This phenomenon has been discussed earlier on this web portal, in the column about the neoricardian theory of Sraffa. In a many-goods economy the wage level must be a money sum. For instance a rising wage level could force up the product prices to such an extent, that the households would be able to buy less products. That implies a loss of the utility of the wage, so that leisure time becomes more attractive. In that situation more wage means that the supply of labour would diminish14. Just now it has been stated, that in a many-goods economy the wage level must be a sum of money. This implies that the (nominal) wage level can rise, while a simultaneous inflation can prevent the rise of the purchasing power (real wage level). Then also the utility remains unchanged, and the workers will not supply more labour. The neoclassical model always supposes that the markets are completely cleared. A structural unemployment is impossible, because the wages can adapt in a downward direction. This ignores the possibility that the entrepreneurs simply lack the trust in the profitability of production expansions. In other words, the neoclassical theory ignores the Keynesian hierarchy of the markets. First investments are required, and then consumption is needed, before the employment can increase. The reader sees how Heine and Herr have a crushing criticism with regard to the neoclassical model of the labour market. This criticism almost pales the phenomenon of the disutility, which in principe is reconcilable with the neoclassical paradigm. It is naturally important to include in the neoclassical theory also the real costs of the production. But if Sam de Wolff would have known all this, he would perhaps indeed have omitted several chapters in Het economisch getij. The formula 7 expresses that thanks to the option of exchange the optimal marginal disutility OI(n, topt) depends in part on the preferences for the other products m. The resemblance with the formula 4 is striking. Conversely the formula 7 has the peculiarity, that the price pn of the product n is related to the onlust intensity (the marginal onlust, or disutility) caused by its production. This reminds somewhat of the labour theory of value of Marx, where the price depends on the amount of expended labour time. The product price is determined by the workload, en not by the value of leisure time. This formula 8 truly conforms to the marxist tradition. For now the exchange proportions are determined completely by the ratio of the marginal disutilities of labour. The prices are no longer determined by the needs of the consumers, but by the onlust of the workers. De Wolff revives Marx in a mannier, which is unique in the economic science, as far as your columnist can see.